How can technology be harnessed to further humanity? I have long been fascinated with our need and attempts to better balance humanity and technology. I’ve read about it, used it in my book’s title, and lectured about it in various incarnations around North America since 2009. 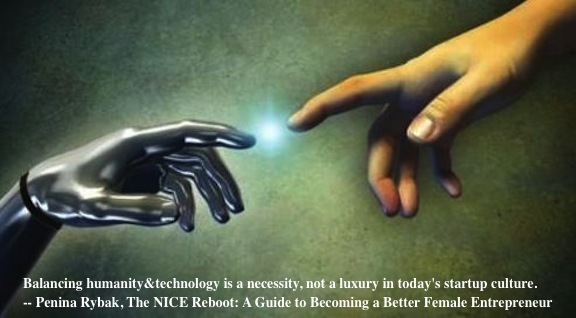 I’ve written about it in my book, The NICE Reboot: A Guide to Becoming A Better Female Entrepreneur- How to Balance Your Cravings for Humanity & Technology in Today’s Startup Culture. I even spoke about it yesterday when I had a book signing at BookExpo America in Manhattan. That’s why my 1 hour autographing session turned into 3! I have to thank my editor Jim Pennypacker for arranging everything and making sure I didn’t run out of books….or pens! Balancing humanity and technology is our collective legacy, and something that Steve Jobs and Apple™ Inc. have done so well. The iPad commercials speak for themselves; works of art which showcase Apple’s talent for storytelling and tapping into our Theory of Mind. Technology is and should always be, about making life better for people. That’s why Tim Cook restarted Apple’s philanthropic arm, and why he purchased Beats. That’s why I am eager to watch his keynote address at the WWDC on Mon 6/2/14. If the future of technology is all too human, then we need to rethink how to harness it for the benefit of mankind. We need to rethink what students will be learning in the future, and what soft skills need to be taught for future success in the workplace. We also need to rethink the impact innovation will have on different areas of technology. It’s something that hit home when the New York Times Innovation Report recently went public. It’s something that’s been on my mind since hearing about the book Creativity Inc. (and putting it on my to-do list) and reading about all the things Pixar can teach us re: best practices for “talking human” in business, staying in touch with our inner child, diversifying our approaches to entrepreneurship, and in fostering a collaborative culture. Which brings me to my next point….. I believe that one of the best ways to harness technology to further humanity is to have higher overall standards for which apps get developed and deployed for the masses. To have a unified philosophy about problem solving as a moral calling, and about balancing purpose and profit, both of which are what my NICE Initiative is all about. (You can learn more about my NICE Initiative seminars on my Slideshare page). Do we really need an app that delivers alcohol to our doorstep? Do we really need another dating app to join the ranks of Hinge, the anti-Tinder? I think that it’s time to for tech startups and ed-tech startups in particular, to discard the Silicon Valley mindset while retaining its venture capitalist attitude towards funding projects with real potential for disruptive innovation….the education of our children. The ones whose minds and social skills are being shaped one finger swipe and Minecraft game at a time. That’s why as an educator/ speech therapist I created my Socially Speaking™ iPad App in 2012 as a social skills TEST for young children at risk for behavioral issues, instead of deploying it as a game. That’s why as an ed-tech consultant and public iPad Evangelist I tend to endorse apps that promote productivity, critical and agile thinking, creativity, and collaboration. Apps such as Minecraft, Explain Everything™ by Bart Gonczarek, and Stick Around by Tony Vincent. App developers need not be the proverbial hacker or dreamer looking to cash in anymore. It’s time to teach more people, especially children to code, so that they can think about the world in a new way. So that they can treat those in it better, and help foster a truly globally connected society. Which brings me to my final point…. The Digital Age is rife with promise for real disruptive innovation across the board, especially in healthcare. Much is being written of these days about wearable tech in healthcare, how startups are changing the healthcare industry, which jobs of the future will synthesize healthcare with computer programming, and which new technologies will change humanity. The first step to balancing humanity and technology in healthcare is to implement a methodical plan created and deployed by professionals on BOTH sides of the table! It’s a pet peeve of mine as someone who has dealt with corporate”suits” in Washington DC or in Medicare who have never been in “the trenches” and thus don’t see the value in giving a child with Autism an iPad to help him/her learn and/or communicate, or who deny a patient an extension of his/her therapy regimen beyond the allotted 8 times cap. It’s time to rethink the concepts of universal coverage, service delivery, and patient safety. It’s time to proactively establish updated, clear, and enforceable policies. It’s time to do it before the mass production of 3D printers and the subsequent potential for a “black market” surge of activity on the “DarkNet” AKA Silk Road does it for us, by default. The first step to balancing humanity and technology in underdeveloped countries is to be philanthropic. The second is to be curious and ask questions. Learn about other cultures and countries. Help people implement diverse, ethical, and collaborative social reform and leadership. Help them recognize education as a priority, something CLASP International does in Zambia, and of which I’m a part of. It’s something that I wrote of in the Huffington Post and again on LinkedIn. It’s something being discussed today at the eLearning Africa 2014 Conference in Uganda. A bona fide entrepreneurial mindset involves understanding the “politics of the playground” by recognizing opportunity and diversifying the ecosystem. A bona fide entrepreneurial attitude (which is different than mindset and something I wrote about earlier in this series) involves having an optimistic outlook about life and those who cross your path. It helps us persevere, reframe success and failure, and actively embed civic engagement into our daily practice. 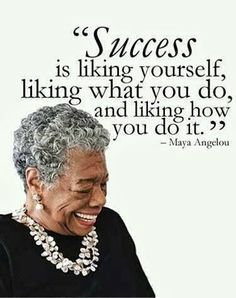 It’s something Maya Angelou taught by example and by her intelligent, insightful, and thought provoking writings. She gifted humanity with a legacy that will transcend time, and she will be missed. She provided thought leadership before it was fashionable, was a true inspiration for women all over the world, and gave new meaning to the concept of writing being an equalizer. We now question whether or not the Internet is the great equalizer re: philanthropy, education, and social communications….but that question will be explored next time. This entry was posted in Balancing Humanity & Technology, Musings on Humanity, Social Entrepreneurship, Uncategorized and tagged Apple, BookExpo America, code, education, entrepreneurship, Humanity, IPad, Maya Angelou, NICE Reboot Book, Penina Rybak, Technology, Tim Cook. Bookmark the permalink.